Cholinergic Ligand Interactions presents the papers read at a symposium held at the State University of New York at Buffalo, 25-26 May 1970. The recent purification and crystallization of acetylcholinesterase together with real progress in the purification of receptor components indicated the desirability of organizing a symposium to discuss not only these aspects but also the structural bases for cholinergic ligand interaction with these macromolecules, the conformational changes involved with ligand binding, the quantitation of cholinergic ligand binding sites, and the roles of acetylcholinesterase and its isozymes in muscle disease. The volume contains nine chapters and begins with a study on possible conformational changes in acetylcholinesterase. This is followed by separate chapters on the subunits of acetylcholinesterase; in vitro studies with the cholinergic receptor of the eel electroplax; identification and isolation of acetylcholine receptors; assay and properties of essential (junctional) cholinesterases of the rat diaphragm; and structural variations in cholinergic ligands. 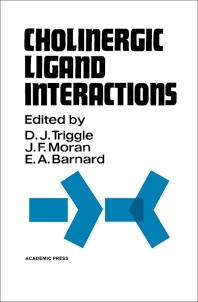 Subsequent chapters deal with ligand interactions at the muscarinic receptors and changes in cholinesterases isozymes during normal and dystrophic muscle development.